Whoa I almost missed this. 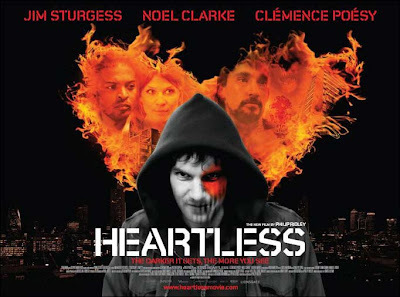 The BFI are previewing Heartless this weekend as part of their Future Film Festival. Writer Director Philip Ridley will be in attendance and a QA session will follow the screening of the film. The trailer shows a blend of social alienation prevalent in bid cities as well as a touch of the supernatural and blew me away. Early screenings of the film have gone down very well. Heartless is definitely one to look out for. Jim Sturgess and Eddie Marsan stars in a dark psychological thriller.The story follows Jamie, a troubled young man with a birthmark on his face, which has left him feeling isolated and fearful, hiding from the world outside. He lives in the East End of London, an area notorious for its violent hooded gangs. According to news reports, the gangs are now wearing demon masks. But, one night, Jamie discovers the terrifying truth: the gangs are not wearing masks. They are real demons. And when Jamie's mother is killed by them in a brutal attack, he realizes he can no longer hide away. Jamie vows vengeance and turns vigilante. But the world outside is more of a nightmare than he ever imagined. As Jamie himself says: "I open up the window and madness flies in. Part of what makes Heartless so special is also the soundtrack. A selection of rock/pop songs were specially written for the movie, and performed by actor Jim Sturgess who also proves here that he has a real talent for singing as well. Born with a heart-shaped mark over one eye, Jamie is single and lonely. Living in an urban world dominated by demonic street gangs has convinced him that life is meaningless and ugly. After witnessing the violent death of his mother, Jamie meets the charismatic but malevolent Papa B, who reveals the truth behind the seemingly chaotic violence and paths the way for Jamie's happiness. An intelligent genre-mix of horror, black comedy and social realism. Please note, actor Jim Sturgess is no longer able to attend the Q&A after this screening.